Get Frogs & Toads to Eat Your Bad Bugs! | Gardens Alive! Get Frogs & Toads to Eat Your Bad Bugs! Question. Mike: We have problems with cucumber beetles and squash bugs. 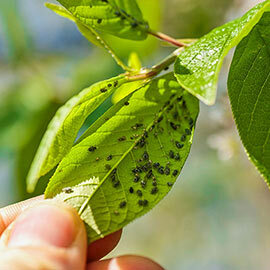 We've used organic sprays and hand picking without much effect, and want to avoid chemical insecticides. What can we do about these obnoxious critters? Do you have a solution to a growing problem with mole crickets on our ball fields? The only answers I can find online involve heavy pesticides, and we try and put nothing on our grounds that would affect the water quality (we like to be able to eat our local seafood) or be harmful to anyone who may "eat grass" in the course of a ball game. I have had trouble with sod webworms in my lawn for a number of years…. What is the best way to control potato beetles? Hand picking is not feasible. 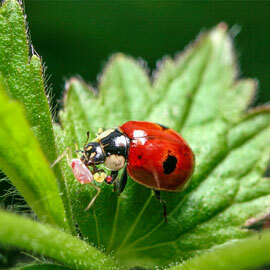 Last year I thought I had ladybugs in my garden only to discover they were Mexican bean beetles! They were so destructive; what can I do about them this year? Gypsy Moth caterpillars have denuded our local oaks, pines, mountain laurel and even wild blueberry plants. What can I do to protect my landscape? I have little red ants in my organic garden that like to bite. How can I get rid of them? Answer. Beneficial nematodes control pests like beetle grubs and flea larvae, unfortunately not ants. But all you have to do to stop them is drop the 'nema' and get with toads! Voracious predators of garden pests, toads (and frogs) are especially fond of ants. Back when I was editor of ORGANIC GARDENING magazine, our researchers discovered that a single toad will eat tens of thousands of pests in a single season, typically consuming two to three times it's weight in the above named creatures—plus flies, earwigs, grasshoppers, pillbugs and cutworms—every day. (Actually every evening, as that's when toads are out a 'hunting.) And toads and frogs are virtually the only beneficial creatures that eat cucumber beetles, a garden pest that makes itself taste bitter when it feeds on your cuke vines! Attracting frogs and toads won't harm the local water quality. In fact, access to clean water is one of their biggest necessities. 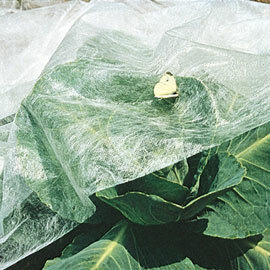 The other is protection from pesticides. Because of their porous skin, frogs and toads (and salamanders and other beneficial amphibians) are helpless against toxic herbicides, insecticides and fungicides. So resolve to shun those nerve toxins and hormonal disruptors this Leap Year Day, February 29th; when conservationists are launching "the year of the frog" to try and raise awareness and stem the tragic decline in amphibian species. Do your part to help keep the 'leap' in Leap Year and get rid of your pests at the same time! Now, toads are ubiquitous—they're also everywhere; in every state in the union, often reaching deep into the heart of cities, especially cities with well-established park systems. To get these cute little amphibians to control your pest problems, let nearby areas go wild with plants that throw a heavy shade. Or build little toad sanctuaries by placing some bricks on the ground to support boards and then covering the boards with plant pots or soil, creating a cool, damp, dark little cave-like structure they can hide in during the day. If you choose to use those cute little terra-cotta 'toad abodes', be sure to keep them in damp, shaded areas; they become toad microwaves out in the sun! You'll also want to place water sources at ground level near plants having pest problems; birdbath saucers sunk flush to the earth work great for this. The toads will naturally migrate to the moisture when they come out at night and then eat the closest bugs. Rinse the saucers out once or twice a week to keep the water fresh and foil mosquito breeding. There's no need to relocate toads from a nearby park unless your garden is a backyard in the middle of a concrete cavern of a big city; and even then, they're probably still around. Whatever you do, don't release mail order, pet store or otherwise imported toads or frogs; such non-native species quickly become their own pest problem. Frogs require a fairly large, year-round water source in which to breed. And they prefer to be alone in that water in the Spring, when their eggs and tadpoles are helpless against hungry fish. But such a pond or water feature is well worth the effort, as it will also greatly increase your toad population and attract hordes of desirable birds, butterflies, dragonflies and beneficial insects. And its easy to prevent mosquitoes breeding in that water with a monthly application of BTI. A completely non-toxic natural organism isolated from soils, BTI prevents mosquito (and black fly) larvae from developing without harming fish, birds, or anything else.